Serif has launched free trials of its Affinity Photo and Designer apps, offering 10 days of premium photo and vector editing for Windows users. The Affinity suite is a low-cost alternative to Adobe’s Creative Cloud software, and was exclusive to macOS until late last year. Affinity Photo (a substitute for Photoshop) and Affinity Designer (an Illustrator analog) both arrived on Windows in November. 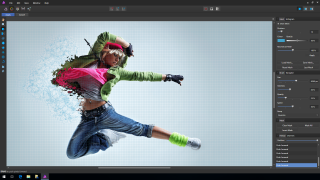 InDesign alternative Affinity Publisher is due to complete the trinity later this year. The PC versions of Serif’s creative software are identical to their Mac counterparts. Affinity Photo’s toolkit includes RAW processing, panorama stitching, warping tools, a healing brush, and all the advanced color-refining tools you’d expect from a premium image editor. Affinity Designer is ideal for illustrators and web designers, with unlimited artboards; non-destructive effects and adjustment layers; RGB, CYMK, LAB, Pantone and ICC color management; and 10 million+ per cent zoom.